Caribbean pirates, those marauders of the Spanish Main who have fascinated children and armchair adventurers for decades, had only a passing interest in Florida's Keys, but they made important contributions to its history. 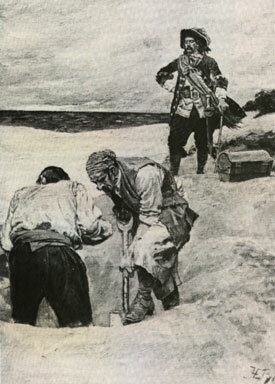 Existing records indicate that during the era of the famous buccaneers such as Blackbeard, Calico Jack and Black Bart (1695-1725), the Keys provided convenient cover, from which to ambush merchant shipping. The Straits of Florida, the Gulf Stream-fed passage between the Keys, Cuba and the Bahama Bank, was an essential trade route for almost all shipping between Central and South America, and Europe. Because the sea was neutral, governed by no country and policed by no authority, it was open to lawlessness. Ships traversed it at risk of being seized and plundered by sea-going bandits. Early on the Keys were the province of Calusa and other native Indian groups, who were not friendly to non-Spanish speakers. Europeans making landfall often were in jeopardy. Furthermore, the Keys were girdled by a long coral reef, which, along with the shallows behind it, made navigation dicey for large sailing ships unfamiliar with the waters. Unlike the well established ports of Havana, Port Royal and Nassau, there was no place in the Keys for pirate ships to unload spoils or buy provisions and no facilities to carouse and wench. 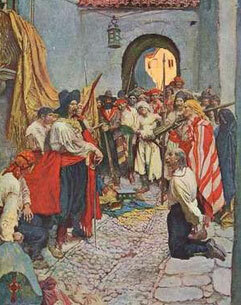 Movies and books have portrayed the life of pirates as one of excitement, fun and adventure, but the truth is most were hardened criminals, cutthroats and thieves. And drunks. Like most men who went to sea on sailing ships theywere kept fortified with rum, as much as a quart per man per day, according to British naval records. Provisions were scant. Rats and weevils infested most of the stores. Personal safety was rarely a consideration, and medical care was primitive at best. An average sailor's life expectancy as a pirate was about four years and usually ended in being shot, hanged, stabbed to death or drowned. Authorities estimate that almost 3,000 instances of piracy occurred between the end of the War of 1812 and 1822, some of it along the Keys. 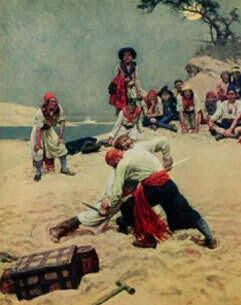 In 1822 Congress expanded its anti piracy squadron and put it under the command of Capt. David Porter who had distinguished himself in the War of 1812. Porter, who was given the honorary title of commodore, established a headquarters on Key West. He bought eight shoal-draft, fast sailing Chesapeake Bay schooners and five 20-oar gun barges that could be rowed into shallow inlets and coves. The barges could be towed behind a steam-driven, side-wheeled ferryboat named the Sea Gull, the world's first steam warship. Porter chased the pirates across the Straits and up the Keys, pursuing them into the shallows with his small boats when necessary, and eventually was responsible for eliminating most of them. But his high-handed tactics in dealing with the local community caused several residents to opine that the presence of pirates might be preferable to the pomposity of Porter who considered the whole island to be U.S. government property. Like most residents, Porter and his men were plagued by yellow fever carried by the mosquitoes that thrived in the Keys. 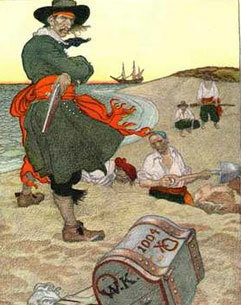 More sailors were lost to the disease-about 60 percent- than to encounters with pirates. At first Porter found Key West an unappetizing location, but as a military man he also recognized the island's enormous strategic advantage. In a report to the Navy Department he wrote that Key West's "vicinity to Havana, placed as it were, in the thoroughfare of vessels sailing through the gulf, making it, in many points of view, an object of great importance to the United States."